A dental salt made from the natural ingredients of the Miswak wood. When necessary, the moistened head of the SWAK toothbrush can be dabbed into the tooth salt so that the valuable ingredients from miswak wood are available again. A dental salt made from the natural ingredients of the Miswak wood. The SWAK tooth salt can also be considered as a toothpaste concentrate. The natural, oral health promoting ingredients from miswak wood are dissolved and removed by some applications. The SWAK toothbrush can then be refreshed with the SWAK tooth salt! When necessary, the moistened head of the SWAK toothbrush can be dabbed into the tooth salt so that the valuable ingredients from miswak wood are available again. 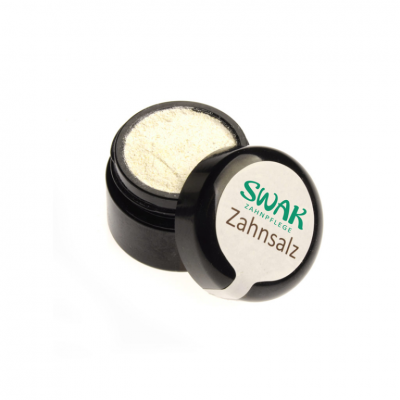 The SWAK tooth salt is to be used very sparingly! When used with dental salt, fine cleaning particles (silicates) help cleanse and help to remove deposits. The SWAK tooth salt is used very sparingly! In a screw-on jar made of purple glass with plastic lid. The SWAK tooth salt consists of powdered Miswakholz and finely ground crystal salt. Also included are calcium bicarbonate and sodium carbonate.